This course leads to a Illinois Concealed Carry Training Class Certificate of the required subjects, to obtain your Illinois Concealed Carry License (CCW) from the State Of Illinois. The course objectives are to teach an individual the basic knowledge, skill and attitude necessary to become a safe and responsible gun owner. It will cover the following topics: Basic Principles of Marksmanship, Care, Cleaning, Loading and Unloading of a Concealable Firearm, Firearms Safety, Weapons Handling and State and Federal Laws Relating to the Ownership, Storage, Carry and Transportation of a Firearm. Active, retired, and honorably discharged members of the United States Armed Forces shall be considered to have completed 8 hours of the 16 hour training requirement. Applicants who have completed a training course that is approved by the Department and recognized under the laws of another state may get up to 8 hours of training toward the 16 hour training requirement. A list of courses approved for up to 8 hours credit is available below. Gun owners in the nation’s third-largest city (Chicago) will no longer have to register their firearms with the local authorities. Illinois Concealed Carry Classes currently offered to Chicago residents. (2) day 16 hour session is $150 for material, handouts and Firearms Guide. A deposit of $60.00 is required at registration to secure your seat for the class. Upon completion of the concealed carry course you will have to apply for your permit with the Illinois State Police. The fee for your concealed carry permit is $153.53. There is an additional charge for ammunition (Or you may bring your own). Students must register week one (1) week prior to class online or by calling 773-697-4249. Classes are held at 2958 W Belmont Ave Suite 1, Chicago, IL 60618. Classes are scheduled from 10:00 AM to 8:00 PM on Saturday. Classes are scheduled from 10:00 AM to 4:00 PM on Sunday. The deposit is NON-REFUNDABLE. A credit will be issued for a future session. The weekly class schedule is listed in the left hand column. CALL TO RESERVE YOUR SEAT! 773-697-4249 or REGISTER HERECLICK HERE TO REGISTER ONLINE! The Illinois State Police sent a survey to each state to determine which of them has concealed carry laws that are substantially similar to Illinois. Currently, the only states consider to have substantially similar concealed carry laws are Hawaii, New Mexico, South Carolina and Virginia. Therefore, out of states residents of these following states may obtain a Illinois Concealed Carry Permit after completing the require 16 hour course. A copy of the Certification of Completion of a Firearm’s Course will be kept on file. As you prepare to service your community by teaching the Illinois Concealed Carry Course you can connect with ICCTC Services!!! We service all Certified Firearm Instructors. No need to worry about expensive equipment, costly maintenance or licencing fees!!! Your business can meet the fingerprint requirement without the added expenses. We will provide the fingerprint capture and transmission service to those applicants who choose the expedited applicant process with fingerprinting. ICCTC Services can travel statewide to you! Please call us for additional information. 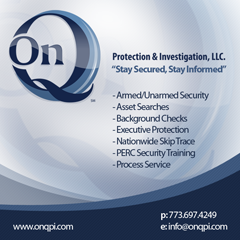 To learn more about how you can benefit from our business opportunities, please contact Tony Q., President of Professional Development, at 773-697-4249 or email tony@onqpi.com.